Constance Yu-Hwa Chung Povich was born on 20th August 1946 in Washington, D.C. USA, being the daughter of a Taiwanese Diplomat. She is a journalist, famous for being the first woman to work as a co-anchor for the “CBS Evening News”, and also the first Asian to anchor a major American network newscast. So just how rich is Connie Chung? The journalist has an estimated net worth of $15 million, her wealth having been made working for various television news networks, including CBS, NBC, MSNBC, CNN, and ABC News. Chung’s career now amounts to over 40 years working as a journalist, and recently as a teacher/lecturer. 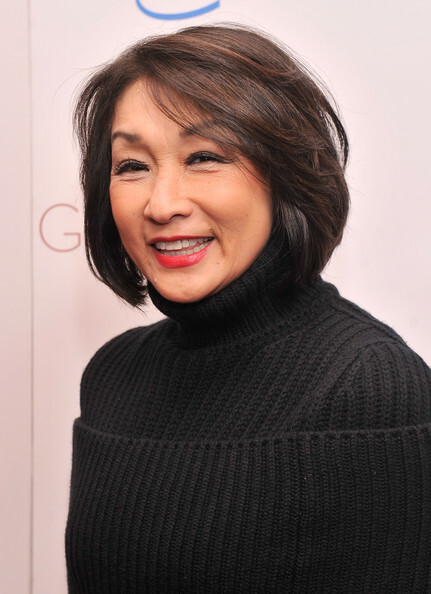 Connie Chung graduated from the University of Maryland, College Park in 1969 with a degree in journalism, and started her career at Washington’s WTTG-TV, where she worked as a reporter. In 1971, she became a Washington-based correspondent for CBS News; during the Watergate scandal, she obtained an exclusive interview with President Richard Nixon, which helped boost her career considerably. Her fame grew after leaving for Los Angeles, where she worked for KNXT, a CBS affiliate (now KCBS). In LA, the journalist was also an anchor for “CBS Newsbriefs” for the west coast. Her net worth was rising steadily. In 1983 she moved to NBC, where over the years she was involved in the projects “News at Sunrise”, “American Almanac” and “NBC Nightly News”, and succeeded in becoming one of the most popular journalists in television. In 1989, Connie Chung signed a contract with CBS, where she became the host of “Saturday Night with Connie Chung”. Four years later, in 1993, she was the second woman to co- anchor a national news broadcast, the “CBS Evening News”. Between 1993 and 1995, the journalist hosted a second project on CBS, a 60-minute show called “Eye to Eye with Connie Chung”. A series of controversies generated by her interview style persuaded CBS to remove Connie Chung from the co-anchor chair, and in 1995 the journalist left the network. By this time, she had already created a strong image based on her interviews and the way she used to deal with various situations and personalities: during her long career, Chung has interviewed numerous famous people at key moments of their lives, such as Martina Navratilova, Claus von Bulow, and Earvin “Magic” Johnson. In 1997, she moved to ABC News, where she worked as a co-host with Charles Gibson for “20/20”. Records mention the first interview with Congressman Gary Condit after the disappearance of intern Chandra Levy as the best performance Chung made while working for this network. Soon after leaving ABC News, she had a brief collaboration with CNN, where she hosted “Connie Chung Tonight”, which brought her $2 million a year and contributed significantly to the journalist’s total net worth. From January to June 2006, Chung co-hosted the show “Weekends with Maury and Connie”, together with her husband Maury Povich. The show aired by MSNBC ended with a controversial last edition, which Chung called “a giant self-parody”. Connie Chung is now teaching at the John F. Kennedy School of Government at Harvard University. She is also author of the paper “The Business of Getting “The Get”: Nailing an Exclusive Interview in Prime Time”. In 2011, she was a judge for the Miss Universe competition. In her personal life, Connie Chung married journalist and television host Maury Povich in 1984. The couple have an adopted son and two daughters from Povich’s previous marriage. 1 I was just going at this career - boom, boom, boom! Then all of a sudden, at 38, Oh, my God - I forgot to get married! 2 She was nominated for a 2013 New Jersey Hall of Fame for General Services. 3 She received teaching fellowship at the Kennedy School of Government at Harvard University. 4 She was the first journalist to interview basketball legend Magic Johnson, after he went public about being HIV-positive. She was also the first to interview congressman Gary Condit, after his intern Chandra Levy disappeared. 6 Met her future husband, Maury Povich, in 1968 at the local TV station in Washington, DC (WTTG), where she was a secretary and he was an anchorman. 7 Attended the University of Maryland, where she first majored in Biology and then switched to Journalism. 8 The only person in history (male or female) to have served as a substitute anchor for all three network nightly newscasts (NBC Nightly News with Lester Holt (1970), CBS Evening News with Walter Cronkite (1962) and ABC World News Tonight with David Muir (1953)); as well as all three network morning newscasts (Today (1952), CBS This Morning (1987) and Good Morning America (1975)). 9 Daughter-in-law of Shirley Povich.